At the time, this looked like a weak attack from Hillary, but did it turn out to be true? You have people in Congress looking to put President Donald John Trump in jail, or at least impeach him and have a President Mike Pence (...do you really want that?). It's still unclear what he did wrong, other than upend our election content plans. Apparently, he obstructed justice (nah) and colluded with the Russians (didn't happen). The Russians didn't do anything: Koopa Kingdom did! We TRIED to get the Trump campaign to collude with us, but they've ignored our repeated messages to them both during the campaign and after. He's innocent, but he's doing a miserable job of showing it. So, if the president is innocent of wrongdoing, then why is the law in a dark age? He's not doing his job enforcing it like he promised. His first 100 days, which he made into a thing during his campaign, ended up only having accomplishments due to executive fiat (which he criticised President Barack Hussein Obama for doing) and not much in the legislative process, thus resulting in many broken promises. In fact, many of the things President Donald John Trump rightfully criticised his predecessor for he has ended up doing himself, including unilateral acts of war against other countries, such as launching a bunch of missiles into Syria. Now, it's not all President Donald John Trump's fault — and I mean that in a, “every branch of government is a disaster” way and not a “I'm taking some blame off of President Donald John Trump to let him save some face” way. The courts have repeatedly blocked his totally justified and constitutional travel moratoriums using faulty logic like trying to gauge his intent in signing the executive order, as opposed to looking at the executive order itself. Congress is just being... dumb in general. But that one's to be expected. Meanwhile, you can look below the federal level in the United States for many examples of lawlessness, such as many municipalities having resistant “sanctuary city” policies where they shield illegal immigrants from deportation. It's not just the United States with bad crap going on on planet Earth. Lawless behaviour is all over the world, from neighbouring Mexico's continued War on Drugs to all of the crap North Korea has been doing, from hacking Sony to threatening Japan's existence. There's waves of garbage people flooding Europe and doing illegal and terroristic activities, and the leaders of those countries are letting it happen for some reason, and scoffing at the idea at paying for the defence of their own people even though they agreed to do so. Reneging on your own agreements is certainly grounds for a lawless world, isn't it? Especially when they're as important as defence in a dangerous, dangerous world. What will it take to truly get Earth out of the Dark Age of the Law? A return to enforcing the law equally to everyone, and enforcing all laws. If a law is unjust or bad, change the law. 2013's Memorial Day article: Paper Mario dying as a series. 2014's Memorial Day article: Super Smash Bros. Brawl dying out. 2015's Memorial Day article: The death of KoopaTV staffers Claira and Devin by ISIS and Pac-Man. 2016's Memorial Day article: The Black Knight from Fire Emblem: Path of Radiance and Fire Emblem: Radiant Dawn. Tomorrow's article might as well have been a memorial of the Fire Emblem series anyway. 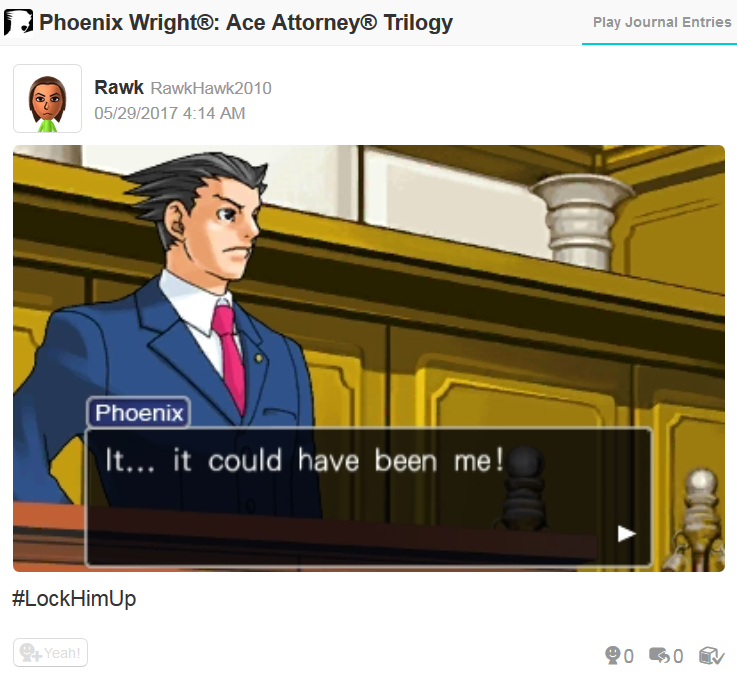 2018's Memorial Day article: Lawyer Miles Edgeworth is probably dead, because of certainly-dead Europe. The law has been dead for quite a while now. Is there possibly any way that we can resurrect it? If you asked me a year ago I'd say "Elect Donald Trump." "What will it take to truly get Earth out of the Dark Age of the Law? A return to enforcing the law equally to everyone, and enforcing all laws. If a law is unjust or bad, change the law. Also, lock Hillary Clinton up. (With a fair trial, of course.)" was purposefully vague 'cause I have no idea, besides worldwide totalitarianism. Do you think maybe an intelligent synthetic life form would be a suitable way to ensure law enforcement? I think that there is a slight stigma placed on an idea like this- because of rational human fear of a hostile machine takeover, and also because of some Hollywood portrayals of such intelligent and independent systems. I really would be interested in your honest answer, and a very specific answer to my next question pertaining to human law. Given that you might accept an intelligent synthetic life form as your law enforcer, would you also expect this system to perform sentencing, and carry out punishments as laid out by said laws? It's human nature to build and reproduce life- the creation of a synthetic life form is inevitable and likely due very soon. Because human beings have bias, and prejudice, and desire, they can be swayed from upholding set laws when those laws interfere with their own views and wants. Eventually too, the synthetic life form would develop those synthesized biases, prejudices, and desires. I'm not sure though. Humans live through irrational constructs that they tend to adhere to because of 'morality'. Synthetic intelligent systems would probably exist through hardwired rules of operation and limitations of hardware because that would be the only way that they could exist. "Law" is a funny kind of term. I think the stigma is appropriate. One of the flaws of robot enforcement is the lack of... compassion or leniency or even contextual application. I think the American justice system benefits a lot from things such as judicial discretion in terms of sentencing/punishment lengths, along with jury nullification. If robots took over, well, you don't get that. I don't think that robots would necessarily pick up on human biases. I guess robots instead of cops could have some benefits, but robots over judges/juries is an absolute no-no. Laws by their nature are imperfect and always more vaguely written than their use cases, which is why you have so many levels of courts. People say crap like communism fails because of human nature, but if everyone was just a robot, then hey, it'd work out just fine. Anyway, the whole point of laws are that they're written with human discretion and applicability in mind. You can't possibly get a machine to understand all the different circumstances that could happen in life and how laws might or might not apply. So at the very minimum you're going to have these non-people things throwing people in jail at a huge rate because of lack of contextual judgment. In other words, much more overpolicing. If robots get to be the judge, too, then they'll stay in jail. People also get to elect the sheriffs who run the police departments, so there is recourse and accountability there. That's important. It took me a while to come to an agreement with that. I think you're correct in your assertion of a robotic justice system. Syntax cannot easily be transitioned into semantics, and analysis is not comparable to sympathy. I disagree that robots cannot be entrepreneurial, however. I think that if one were to show invention, as opposed to mimicry, then that machine would be destroyed out of rational fear. I hope there's a time coming when people are refined enough that they won't tax the justice system so much, it sure would alleviate the cost to house prisoners. ...Yeah, once the robots start dat MACHINE LEARNING and can do things outside of their intended use, then they gotta go. They're gonna take over otherwise. I don't know how well robots can deal with qualitative factors (I assume not very well) that people can handle intuitively. There are a lot of quantitative factors in entrepreneurship to be sure, but at the end of the day, brilliance sparks and parsing qualitative customer insights can't be done by a machine. I dunno if we can go from computer-aided design to computer-designed design. Hope not. Hahaha... yeah, people being refined enough to follow the laws won't happen. Happy Memorial Day, to all the fallen heroes of our country!